After 20+ years of painting, little tends to change in my painting routines. While obviously the level of painting goes up slowly but surely, the biggest change in my painting has been the adoption of a wet palette a few years back. Imagine my surprise when I found myself looking at a new painting tool! I’d been hearing a lot of positive feedback about Citadel’s painting handle, and as it’s a very affordable piece of kit (6,50€ here in Finland), I decided to give it a try. Now, I’ve hardly ever used a painting handle. While I have occasionally experimented with blutac and paint pots, a few occasions of minis suddenly falling off and crashing into the table quickly dissuaded me. My friend Crab Man sitting comfy. Base is 25mm round. Having used the handle for a week now, I’m really happy with it! Also, it has changed my painting a bit. The handle is very nice to grip, the spring mechanism holds the miniature’s base securely (although I’ve only used it with 25mm round slottabases so far, it should work with 32mm, 40mm and 60x35mm oval as well). It does help with finger strain, and helps me keep the model I’m painting just a little bit higher, keeping me from hunching down as much as usual – something my neck and shoulders are thankful for. It also keeps my grubby fingers away from the mini itself. The only downside I’ve noted is that the stiff mechanism can be a bit difficult to operate with one hand – although that obviously helps secure the model in place. Overall verdict: There isn’t all that much that you can say about a painting handle review-wise. If you’re looking for a new painting handle, or are looking to try one, and use minis on round plastic bases, you could do far worse than this. At the price point it’s excellent value for money, and I’m looking to buy one or two more just for convenience. As an added bonus (or minus, depending), it looks a bit like a somewhat painful adult toy, while it’s actually a pain-lessening adult tool. 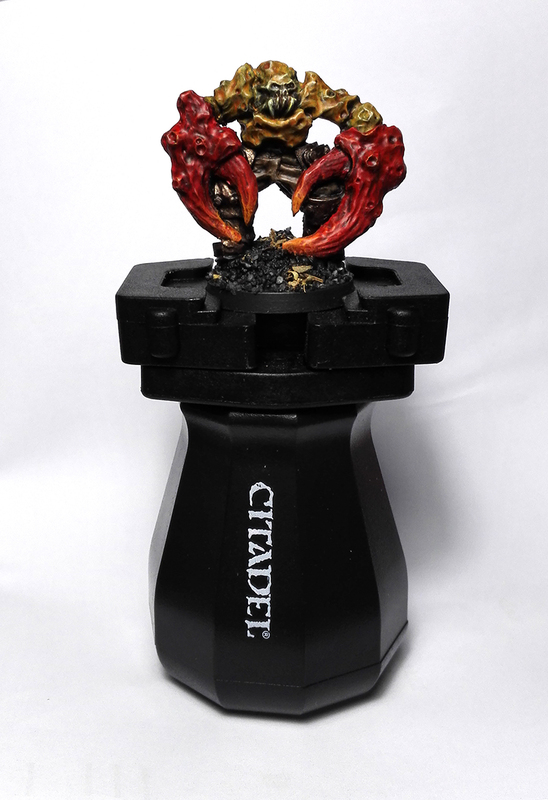 You can get the painting handle from the Games Workshop web store as well as their physical stores. Every time I swing by a GW shop I look at the handle thinking: yeah, I really like to try that thing out, I’ll pick it next time around. Maybe I should actually pick it up. I got a pair of them, but I’ve found that unless I’m painting a model that really specifically benefits from using them, I don’t even think of it. For me it’s really new and special! Weird not holding a mini by its base, such a small thing but makes a big difference. I agree with Azazel, I only seem to use it as an after thought. I guess since I started using my own solution of blu-tac and rubber stoppers, that it’s hard to get out of the habit. I very rarely have a mini drop. You might want to experiment with different types of putty, as they are not all created equal, The rubber stoppers I use are also very low profile, so it’s must easier to paint around them. Still, it’s a good price for the handle and definitely beats not using anything. If only I painted one at a time instead of mostly squads and platoons! My solution has been poster tack on specimen jars or pill bottles. Allows for recycling of both, and is dirt cheap. For some reason it won’t let me “like” your post but take it from me I do haha. Anyway, I’ve been contemplating getting one because, like you, I tend to hunch over a fair bit and 1 I’m a big guy and 2 I’m only getting older haha. I might give it a go.